Juice & Java, despite its name, is more than just drinks and coffee. 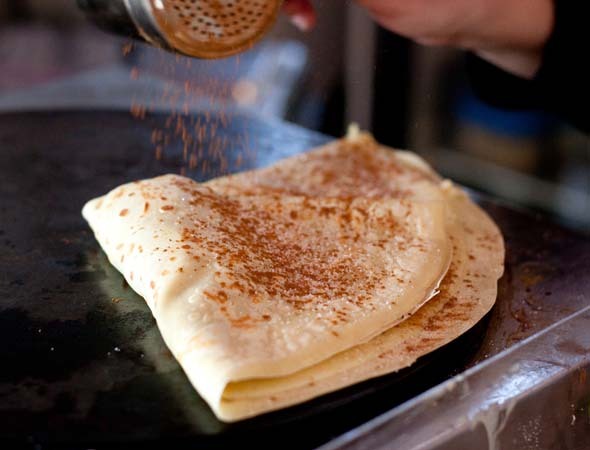 In fact, as I was scanning over the menu boards at the east-end Beaches cafĂŠ, I was told by one of the regulars that I would have to try a crepe in order to truly appreciate Juice & Java. "They're phenomenal," he said. "I love the apples and brie." 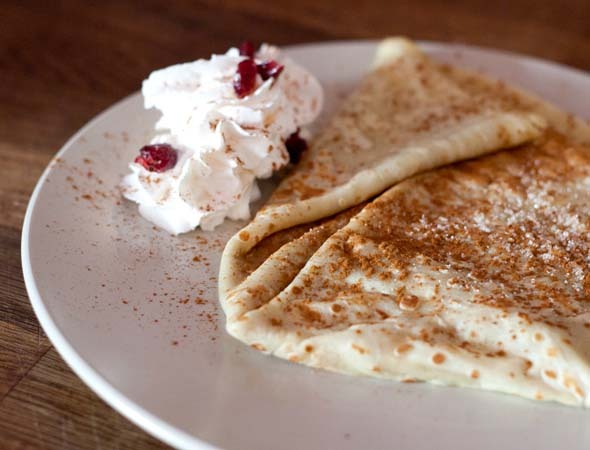 Juice & Java has several options of both sweet and savory crepes, such as its lemon and sugar ($3.95), Nutella, banana, and berries ($7.95), and grilled chicken with sundried tomatoes, lettuce, and red peppers ($8.95). 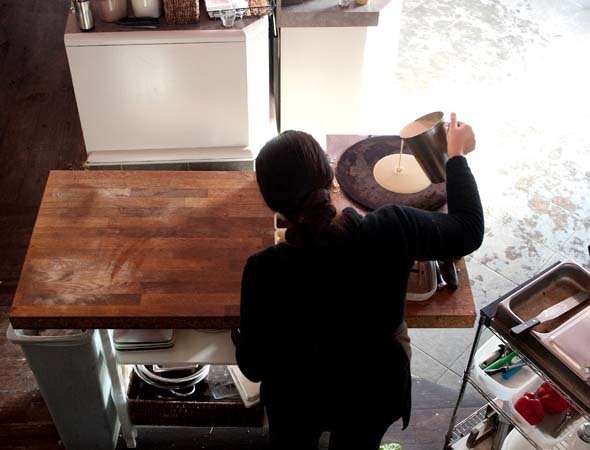 All of its crepes are made to order, so while my veggie crepe with sundried tomato hummus was being prepared, I sauntered around the cafĂŠ to explore its vibe. 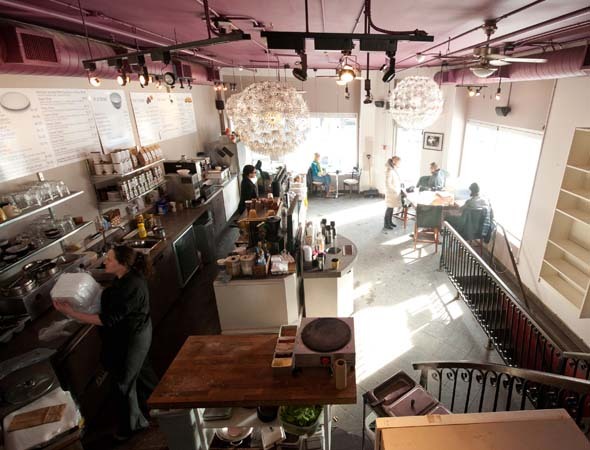 Juice & Java struck me as an ideal place to work or study, with lots of comfortable seating on its second floor. With its purple-painted ceiling, the second floor loft has a few booths, black armchairs, tables and chairs, and an electric fireplace with books such as Murder for Profit and The Odyssey of Homer on its mantle. 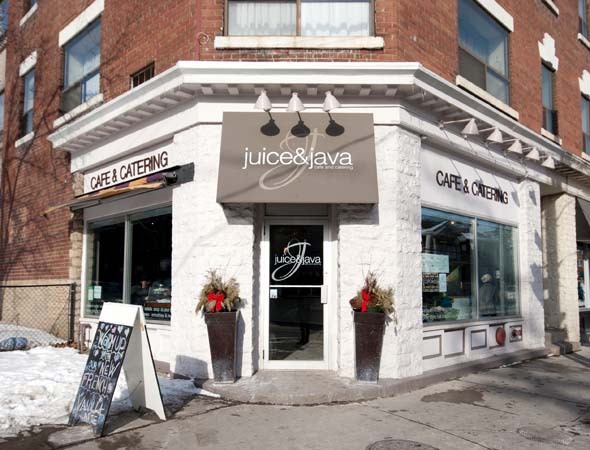 In the summertime, Juice & Java sets up seating outside so customers can enjoy their all-natural smoothies in flavours including Mango Tango and Blunana Bliss ($4.99) amidst the dogs and pedestrian traffic of Queen Street East. When my crepe was ready, I settled at a table by the fireplace and opened the guestbook that was positioned on the shelf. Juice & Java has been in this location for over a year, so I expected lots of detailed reviews. What I got were several entertaining glimpses into people's private lives (one comment read, "Going on vacation with a man I no longer love"), some bible verses, lots of poetry, drawings, and exaltation of all things Juice & Java. "Best smoothies in the land!" "I love the egg salad sandwich!!!" "We are very lucky to have you as a part of our community." I, on a similar note, felt very lucky to be devouring my crepe, which was warm and fresh, and very much living up to the hype. The homemade sundried tomato hummus definitely made the combination, both tangy and unique, yet familiar. Paired with one of Java & Juice's coffees or teas, I could see myself spending many an afternoon getting lost in the scribbled anecdotes of The Beaches' neighbourhood community.